We’d love your help. Let us know what’s wrong with this preview of The True Story of the Whole World by Michael W. Goheen. To ask other readers questions about The True Story of the Whole World, please sign up. Every Christian should read this. I've read through the Bible multiple times and would have said I had a grasp of biblical theology but this book beautifully walks through the story summarizing it into six acts. "This restoration of the creation will be comprehensive: the whole of human life in the context of the whole creation will be restored. Too often our view of the future has emphasized solely the salvation of individual persons apart from the full creation and relational context in which Every Christian should read this. I've read through the Bible multiple times and would have said I had a grasp of biblical theology but this book beautifully walks through the story summarizing it into six acts. Good book on giving you the whole story of the Bible. If you don't know much about the Bible, this is sort of the cliff notes of what is most important about it. Loved this book and wish it had been around when I was studying theology at uni. 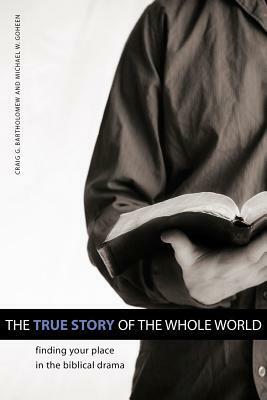 An excellent overview of the Bible (the true story of the world) and our place in the story. I appreciated the addition of "reflections for today" and the questions in "finding our place in the story" at the end of each "Act". I am going to recommend this book to our publishing branch for translation into Spanish. Best overview of the big story of the Bible anywhere! I can't recommend it highly enough. I really don't like writing reviews, but this book deserves something- to call it helpful would be a severe understatement, but that's the first word that came to mind. Even after having read through the Bible, this view of the narrative of scripture tied things together in ways I was not able to on my own, and it has been a catalyst in expanding my view of what God means to accomplish both through me and through the Church as a whole. Consequently, some of my plans have changed; not that it's a I really don't like writing reviews, but this book deserves something- to call it helpful would be a severe understatement, but that's the first word that came to mind. Even after having read through the Bible, this view of the narrative of scripture tied things together in ways I was not able to on my own, and it has been a catalyst in expanding my view of what God means to accomplish both through me and through the Church as a whole. Consequently, some of my plans have changed; not that it's all because of this book, but the content was definitely a contributor to my being willing to consider things I hadn't before and changing my mind about other things I had previously considered not to be possibilities to even allow on the table. Once I sat down to read it, it was easy to read huge chunks at a time, I have notes all over the place, and I'm looking more forward to going through the Bible again with this more cohesive understanding of what I'm reading and studying. This is a great book. It's a revised edition of a previous title, "The Drama of Scripture." A very accessible treatment of the biblical narrative that enables the reader to locate themself in the story of which they are a part. I really can't think of a more helpful book for both Christians and non-Christians alike that are interested in understanding the biblical and Christian view of God and the world. Really good in parts but very drawn out in others. I think it could have been just as thorough in its walkthrough of the Bible and even easier to follow if it were trimmed down a bit. At its present length it would have benefited greatly from some simple visual aids (i.e. timelines for most of the chapters on the Old Testament). Overall, still a rather handy resource. The writing is not great (although improved from the Drama of Scripture) but as a tool/resource in a Christian's library, it is quite helpful and concise. There are parts where I feel it is too concise -- oversimplified... but since it's trying to connect the entire biblical narrative, I understand why at times it stops short of a full explanation. A wonderful guide through redemptive history and a guard against taking verses out of context. This book teaches us to look at all passages light of the whole story of redemption from the Garden, to the Fall, to the history of Israel, to the birth, life, death and resurrection of Jesus and the promise of the New Creation! Doing this adds such richness to our reading of the Word! This is a good overview of the entire Bible from genesis to Revelation. It covers everything well from themes to people to covenants. Theology is a bit conservative now and then, but not so liberal Christians shouldn't read it. Not many books do this and cover the breadth and depth of the Bible in under 200 pages. Really helpful and readable outline of the story of the Bible. I would recommend reading it - at least once! The authors also highlight 'reflections for today' to show how God's plan of redemption outlined in the Bible is still so relevant for each one of us today. I loved the mind-shifts that happened as I read this book. Reading it in a shorter space of time would have given a greater feel for the unity of the themes / acts that this book was threading together. Very interesting read to put the Bible into one story in which to hang other information. This is a great book to hit the highlights of the Whole Bible. I would recommend it to anyone who wants that birds eye view of the Word of God. It was a good overview of the whole Bible while offering some good things to think about and new perspectives. This book offers a great look at Biblical history and adds a great deal of context to the Bible. It's a bit dry at times, but there are a lot of really great insights in here.